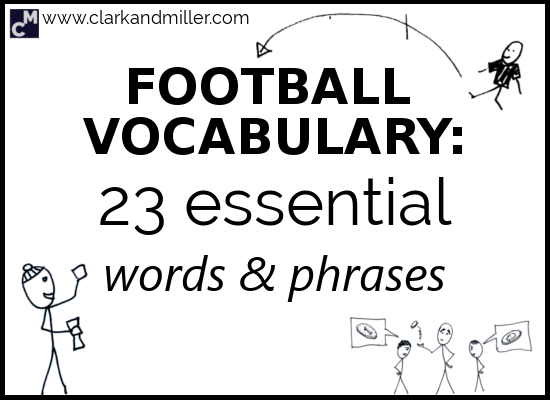 This is part three of a series on football vocabulary in English. If you want more, check out How to Say Football Scores in English and 9 People in Football (And What They Do). Well, we’ve made it this far! It’s almost the end of a rather exciting World Cup. I’m actually one of those people who usually run to the hills while football mania is going on. But this year has been really rather interesting. And I’ve realised that football is quite a complex sport. It’s got lots of weird rules and some complicated procedures. I’ve also realised something else: it’s sometimes good fun to talk about football. Sometimes. And, as we come to the final match, now is one of those times! But what about the actual game itself? We sometimes want to be able to describe what happened in the match, right? Football, like most sports, has a lot of rules and procedures. Some of these might be the same in your language, but do you know how to use them well in a sentence in English? The match is divided into two parts, logically named the first half and the second half. But when do we talk about it? All the players go to the locker room, and the manager shouts at them for 15 minutes. Meanwhile on TV, older ex-footballers sit around a table and talk about the match. Like with “first half” and “second half,” we usually describe half-time as a time phrase. If half-time is the end of the first half, then full-time is the end of the whole match. When the ref blows the whistle to mark full time, the crowd goes wild. By the way, full-time only happens when someone’s won the match. If there’s extra time or even a penalty shootout (see below), then the ref doesn’t mark full time until then. If a player has been injured or hurt (or has been pretending to be injured or hurt) during the match, injury time is added to the match. We can also say that the match has gone into extra time. Here’s something I don’t understand about football. Sometimes you’ll have a match with NO GOALS. Fortunately, during the World Cup and other big tournaments, this doesn’t happen. So if no one’s scored by the end of the second half (or if it’s a draw), then the match goes into extra time, meaning the players keep playing, usually for another 30 minutes. The beginning of the game! The teams choose “heads” or “tails,” and the ref tosses a coin. Whoever’s right wins the coin toss. But here’s the strange thing: the team that LOSES the coin toss is the one that starts the match. The team that wins the coin toss decides which direction they want to play in for the first half. If the game goes into extra time, then there’s another coin toss. It’s the real beginning of the game! The bit when the ball is kicked for the first time! We usually talk about the kick-off when we want to know what time the match starts. Simply put, a foul is when a player breaks the rules. This is usually related to how they try to take the ball off the other players. Sometimes it could involve pulling another player’s shirt. Sometimes it’s an aggressive tackle. Sometimes it’s even tripping up another player. How to use this word? Or we can use say that the player committed a foul. If the ref decides a player’s committed a foul, then he’ll award a free-kick to the other team. That means they get to try to kick the ball into the goal from the penalty area with the other team trying to block it. If the ref awards a penalty kick (or often just a “penalty”), then the situation is basically the same as a free-kick, except that the only player between the ball and the goal is the goalie. It’s the end of the second half — no one’s in the lead. So we go into extra time. Now it’s the end of extra time — no one’s in the lead. That’s when the match goes into a penalty shoot-out. We all know about the penalty shoot-out. Penalty shoot-outs are fun. They’re so intense that we all forget our own names for a few minutes. We all know what this means, right? When a player gets a yellow card (or if the ref gives a player a yellow card), then that’s a warning, and the player’s then more likely to get a red card. When a player gets a yellow card, we can say that he’s been cautioned. This is usually when the player starts shouting at the ref and protesting his innocence. Usually very unconvincingly. When a player gets a red card (or if the ref gives a player a red card), then that’s it. The player is sent off the pitch, and the team can only play with 10 people. No one knows what “offside” means. Just kidding — the offside rule is actually pretty easy to explain. If a player passes the ball to another player who’s behind the player on the other team who’s closest to the goal that they’re trying to get the ball into, then the guy receiving the ball is offside. Well, this one’s a pretty bad one. We usually use the verb “to score” with this one. Here’s a gif of some guy scoring an own goal. And there we are — now you can describe Sunday’s exciting World Cup final in detail to your friends (and enemies)! How have you enjoyed the World Cup this year? What have been the highlights and what have been the low points? Did you like this post? Then be awesome and share by clicking the blue button below. Great post as always, Clark. Thank You so much indeed.